It's not easy having one thrilling action sequence in an arc of a comic series much less four issues in a row but Matt Kindt has done just that. Normally, creators take the time to build up to a momentous fight, or chase, or confrontation, developing characters and building their world around it. Being the old pro that he is, Kindt deftly and concisely moves the plot along, builds his protagonist with succinct dialogue and a lot of action. Aric of Dacia is a born leader with a will to overcome any obstacle despite missing a hand and being forced to become a soldier. And he's doing all this without his super suit, the sentient X-O Manowar armor...by choice! Once again, Aric is tasked with another mission, this time to capture the Cadmium president. He first has to gain access to the sacred lands of the Burnt. The King is skeptical but grants him safe passage. This is what makes "General" Part One a great jumping on point. Kindt establishes the mission from the opening page and through the dialogue with the King, Aric's character is revealed giving new readers all they need to know. What follows is an exciting trip through the Helio Fields where a battle, like the one in Hoth from 'The Empire Strikes Back,' takes place. However, the enemy here is more formidable than the Empire. Doug Braithwaite does some breathtaking work with the penciling. He thrives in close-ups, putting the reader right in the thick of things. The details come from scars, facial lines, and costuming. There's great attention to detail there with some minimal landscapes and backgrounds. It's all laid out in a crescendo of blood and guts. The creative choices to how the enemy's weapons kill Aric's soldiers is gruesome and colorful. Diego Rodriguez is responsible for the colors and they pop at just the right moments, contrasting with the muted backgrounds for maximum effect. 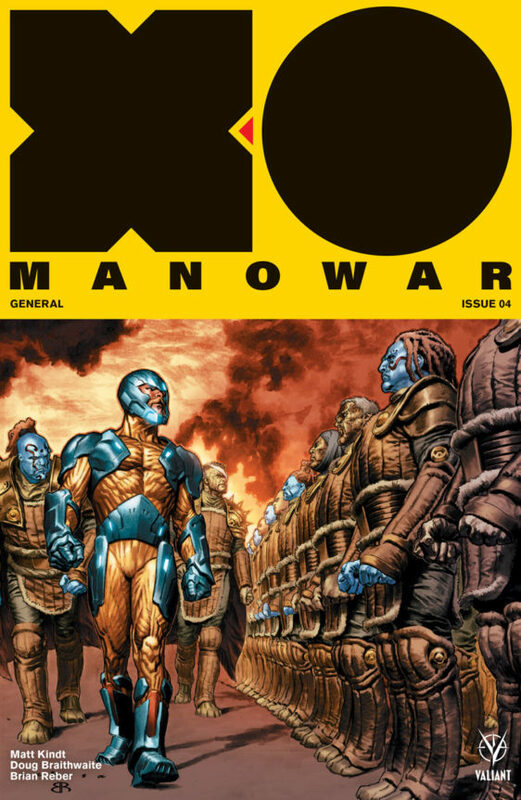 'X-O Manowar' has been an adrenaline rush that's lit a fire under the comic book market. It's everything you could ask for in a sci-fi action story. It's 'John Carter' on Red Bulls and speed. Kindt finds a way to hold on to Aric's humanity amid a relentless war. It's no easy feat and the beautiful visceral art from Braithwaite and Rodriguez makes it visually stunning as well. Stop reading this review and buy it now!